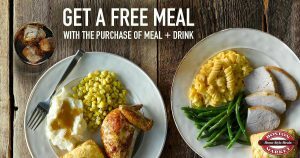 Boston Market BOGO FREE Meal TODAY ONLY !!! Today Only !!!! Print a Boston Market BOGO FREE Meal TODAY ONLY !!! Send a Friend a Free Noosa Yoghurt !!!! Free Axe, Dove or Degree for Men Products !!! Baby Tula Palm Springs Tula Baby Carrier for as low as $84.79 !!!! reg price $140!!! !